Our #1 best selling white ceramic mug. Features a shiny finish with a large C Handle. This mug will not break the bank. Fill the mug with candy for some added interest. Maximize style without maxing out the budget with the 11 oz.budget white mug! 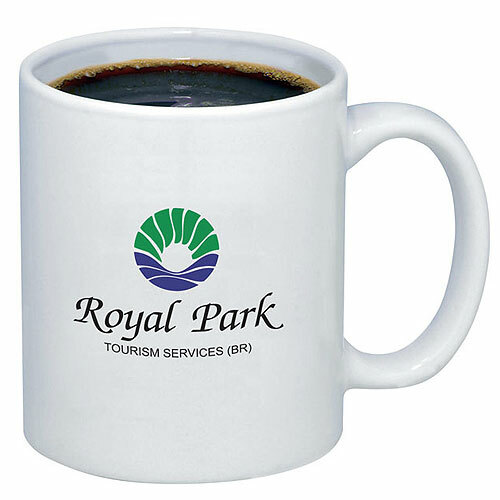 Great to give this mug out in confidence at fundraisers, tradeshows, or corporate picnics. Available in white which will allow your imprint will stand out and make a lasting impression on all of your customers! Bulk / 33 lbs / 36 pcs. / 18 x 15 x 13box. Shipping Charges: 6.25 per 36. To prevent breakage this product must ship in a damage resistant box, add $6.25 per case.